In practice for sixteen years, I see people with a wide range of goals and concerns, from general health maintenance, to stress relief, to alleviation of chronic pain. Dedicated to life-long learning, I continue my training with professional workshops and classes. 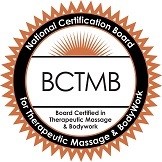 I also volunteer my expertise to massage therapists in Uganda, Africa by teaching proper body mechanics and Swedish massage techniques. New clients receive 10% off their first visit! © Copyright 2019 Cynthia Schell, CMT, NCBTMB. All rights reserved.